Space shuttle Endeavour stands poised for space soon after being moved to Launch Pad 39A for the launch of STS-126 on Nov. 14, 2008. WASHINGTON - NASA could extend spaceshuttle operations to 2012 by adding three flights - at a cost of roughly $5 billion - without dramatically affectingthe agency's plan to return astronauts to the Moon by 2020, according to adraft internal report on delaying the planned 2010 retirement of the orbiterfleet. However,extending shuttle operations to 2015, when a replacement system is slated tobecome available, would cost more than $11 billion and have severe impacts on lunarexploration hardware development, according to the draft report,prepared by a team at NASA's Johnson Space Center in Houston. Bothscenarios assume that the additional funding needed to keep the shuttle flyingdoes not come out of the budgets for developing the replacement system,consisting of the Orion crew capsule and its shuttle-derivedAres 1 launcher. Both vehicles are being developed under the Constellationprogram, which encompasses the hardware NASA needs to transport astronauts toand from the International Space Station after the shuttle retires and later tothe moon. NASAAdministrator Mike Griffin ordered the study in August amid increased concernsover the five-year gap between the shuttle's retirement and the debut of Orionand Ares 1. NASA's plan to rely exclusively on Russian Soyuz vehicles to launchastronauts during that period came under heavy criticism following Russia'sAugust invasion of neighboring Georgia. In a Dec.15 interview, Griffin called reliance on Soyuz "unfortunate in theextreme," but said NASA needs the $3 billion it spends annually on shuttleto move ahead with the replacement system. "Everytime I have spoken about [the gap] I've laid it at the feet of budget,"Griffin said. He emphasized that without an increase in NASA's overall budget,extending shuttle operations will result in a corresponding delay to Orion-Ares1. The shuttleextension study began two months before NASA kicked off another study ofother options for closing the five-year gap. In October, a team from the NASAEngineering and Safety Center at Langley Research Center in Hampton, Va., beganassessing whether NASA could accelerate development of Ares 1 and Orion. NASAofficials have said Ares 1 and Orion will begin space station missions in March2015, although they have set an internal deadline of September 2014 and areunder pressure to further reduce the gap. Theinternal assessments will be compared and finalized before being releasedsometime in January, Doug Cooke, NASA associate administrator of ExplorationSystems, told reporters during a Dec. 17 teleconference. "Thestudy we did on acceleration didn't assume the shuttle extension, so we've gotto get to a resolution on all of that," said Cooke, who declined todiscuss details of a Dec. 15 briefing on the acceleration study. "We needto understand that all together." The shuttledraft report, a copy of which was obtained by Space News, evaluates theimplications of the two- and five-year extension scenarios for their costs,work force implications and impacts on the Constellation program. According tothe study, both options increase the risk of losing a crew or vehicle: Thetwo-year extension increases the cumulative risk from a 1-in-8 probability to 1in 6; extending operations through 2015 increases the risk to 1 in 4. The riskof losing an orbiter or crew on any given mission is 1 in 77, the report said. 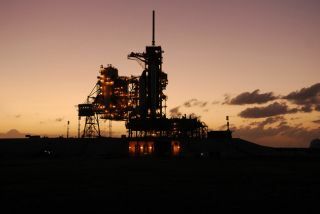 A decisionon whether to pursue either extension option is needed by May 2009 to reverseplans to draw down shuttle operations, the draft report said. A two-yearshuttle extension offers limited benefits but does not carry significanttechnical risk. It does not eliminate the gap or solve work-force retentionissues, but would benefit the space station and provide an opportunity to usethe shuttle to test Constellation hardware. Examples include Orion's thermalprotection system and docking system, the draft report said. Contractextensions of up to 24 months would be required for hardware such as the spaceshuttle onboard computer, robotics, camera system, reusable solid rocket motor,main engines and external tanks. While therewould be no need to produce new shuttle external tanks under the 2012 option,extending related activities at NASA's Michoud Assembly Facility in New Orleanscould delay modifications of the facility needed to begin producing the Ares 1upper stage. That, in turn, could delay the start of Ares 1 upper stageproduction by 12 months, the draft report said, adding that NASA is developingmitigation plans. The launchmanifest under the first option - not counting the November launch of space shuttleEndeavour - wouldinclude 12 flights during the next four years: four in 2009, four in 2010,three in 2011 and one in 2012. Space shuttle Discovery would make its finalflight in August 2010 and Atlantis in February 2011. The22-launch manifest under the five-year extension option features four missionsin 2009 and three in each of the following six years. Atlantis would be retiredafter 2010 and available to provide spares to Discovery and Endeavour. Whilepreserving NASA's ability to fly astronauts to the space station until Ares 1and Orion come on line - albeitat a cost of $11.4 billion - the five-year shuttle extension would severely impact various otherelements of the Constellation, including the heavy-lift Ares 5 cargo launcher. Ares1 and Ares 5 will lift off from a pair of launch pads currently used by theshuttle. Modifications to Pad A to accommodate the Ares 5 are scheduled tobegin in 2012, but a five-year extension of shuttle operations would delay thatby two to three years unless NASA can find a way to use Pad B both for shuttlemissions and Ares 1 test flights, the report said. The five-year optionalso likely would require NASA to move Ares upper stage manufacturingoperations to another facility at Michoud, the report said. The change coulddelay Ares 5 by 18 to 25 months. A 15-month to 16-month development delay on the Ares J-2X upper stage engine, unless NASA can modify its A1 test stand at Stennis Space Center in Mississippi to accommodate testing of both that engine and the space shuttle main engine. The availability of North American Rayon, a specialty material used to manufacture shuttle and Ares solid-rocket motor nozzles, is limited, which means the capacity to produce Ares vehicles would be drastically reduced. Space shuttle solid rocket booster production would require $23 million in 2009 for skills retention, and the insulating material for the motor would require a new indemnification agreement or qualification of a replacement material, as production is scheduled to end in 2010. Orion's space station rendezvous and docking system would have to be altered to allow it to dock at a different location so the shuttle can continue to use its primary docking port. NASA would have to recertify vendors soon to enable extended operations. The 2015option assumes that the space shuttle will cease operations as soon as areplacement becomes available, be it Orion-Ares 1 or a commercially developedalternative.